“Once we got the notice that we actually won the lottery, it felt like we won the lottery,” quips Paul Chu, CEO of a Canadian cannabis firm called Weekend Unlimited. On Monday, Chu’s firm will briefly halt trading on the Canadian Securities Exchange so it can switch from its current ticker symbol of YOLO (as in, “You only live once”) to the more straightforward POT. 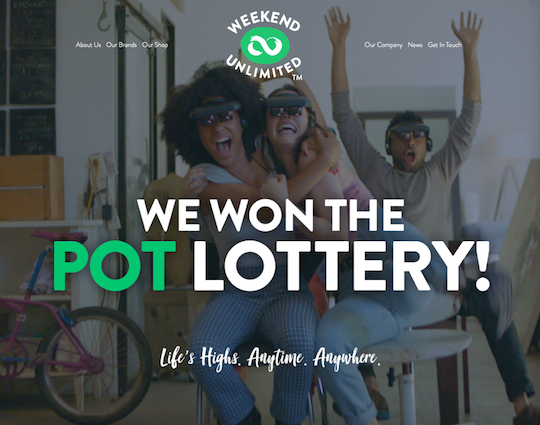 After weeks of hoopla north of the border, Weekend Unlimited won a lottery this week held by Canadian stock exchanges. The prize? Access to perhaps the most desirable ticker for a cannabis company. Weekend Unlimited “has operations in multiple states and provinces across Canada and the United States, including a hemp farm in British Columbia and a cannabis retail business in Alberta,” reports the Toronto Globe and Mail. Shares have jumped 57% this morning. Whether it will trade under POT in the United States (as PotashCorp did) is yet to be determined. For now its slender US$21.8 million market cap consigns it to the over-the-counter trade with the clumsy ticker WKULF. “Cannabis stocks are continuing their convalescence in 2019, along with the rest of the stock market,” says our penny pot stock authority Ray Blanco. And another boost stateside just came from William Barr, the president’s nominee for attorney general. As we mentioned a couple of weeks ago, Barr pledged during his nomination hearing that on his watch the Justice Department won’t bigfoot the states that have legalized the herb. This week, Barr put it in writing — responding to written questions from senators “As discussed at my hearing, I do not intend to go after parties who have complied with state law in reliance on the Cole memorandum,” he wrote. What’s more, Barr committed to expanded cannabis research — a crucial catalyst for many firms in the space. That’s a huge deal, Ray Blanco tells us: “It means that American pharmaceutical companies will be able to compete with their foreign peers when it comes to developing cannabinoid-based therapies. Ray’s bottom line: “When it comes to cannabis, having a laissez-faire attorney general should make a huge difference in investors’ comfort about the future of the industry. Investors hate uncertainty, after all. [Ed. note: Forget about Canadian publicity hounds in the pot space. Ray has his eye on a $4 pot stock that makes more money than any other retail business in America. Two sunny economic numbers are giving another lift to the stock market today — on the heels of the Federal Reserve’s newfound easy-money religion, of course. The Dow is up half a percent at last check, comfortably above 25,000. The S&P 500 is likewise up after reclaiming the 2,700 mark yesterday. Only the Nasdaq is in the red — down fractionally after traders decided they didn’t like Amazon’s quarterly report. Yes, AMZN recorded a third-straight record profit, but the company says it still needs to plow cash into building out its warehouses and other distribution channels. Shares are down more than 4%. The wonks at the Bureau of Labor Statistics conjured 304,000 new jobs for the month of January — way more than the “expert consensus” was counting on. That said, the gangbusters December number was revised downward sharply — from 312,000 to 222,000. The unemployment rate edged up to 4.0%, but that’s because furloughed federal workers were counted as unemployed. Despite a tight job market, average hourly earnings edged up only 0.1%. So there’s no evidence of the “wage inflation” that spooked Wall Street and triggered the big stock market sell-off at this time a year ago. The real-world unemployment rate from Shadow Government Statistics — accounting for all the part-timers who want to work full time and all the people who’ve given up looking for work — jumped from 21.4% to 21.8%. That’s the highest in nearly a year. Meanwhile, the December slump in U.S. manufacturing looks like a one-shot deal. The ISM manufacturing index for January clocks in at 56.6 — up from a two-year low of 54 the month before. (Any number above 50 indicates a growing factory sector.) Most encouraging is that the new-orders component of the survey rebounded strongly. In a move we foreshadowed four months ago, Germany, France and the United Kingdom have launched something called INSTEX, or “Instrument in Support of Trade Exchanges.” Essentially it’s a way to bypass the new U.S. sanctions on Iran. While Donald Trump withdrew Washington from the Iran nuclear deal last year, all three of those European countries were also part of the agreement — and they want to keep it alive. That’s not easy considering the Trump administration pressured SWIFT — the global clearing house for cross-border financial transactions — to freeze out Iranian banks. With SWIFT unavailable, INSTEX is a workaround. For the moment, transactions via INSTEX will be only for Iranian imports of food and medicine. But other goods could be added over time. In addition, all 28 members of the European Union could eventually use INSTEX to do business with Iran. On the other hand, Chinese leaders are finding this “de-dollarization” thing harder than it was cracked up to be. But in one of the lesser-noticed headlines from the World Economic Forum in Davos, Switzerland last week, a senior Chinese official said that’s just not practical. Good to hear it direct from the source — although our Jim Rickards has made the same point in this space before. In addition, the Treasury Department could easily strong-arm U.S. banks into buying any Treasuries the Chinese sell. The Federal Reserve could step in as a buyer as well. To the mailbag: “Kudos to the reader’s letter you published Monday. It’s dead on target. “I say this as a member of the tail end of the boomer generation and one of the few Americans who have experienced European-style economies. Life for my 20-year-olds here in the good ole USA is a joke. Go try to find a job that pays $20.00 per hour and live on it, let alone try to have a family or starter home. Not to mention that my kids have college degrees and tens of thousands of debt — plus, if they get any kind of job, they lose their free (luckily) state health care. Needless to say, they’re still living with me and will be for a long time. “Back in the late 1970s in high school, I stocked grocery shelves at the local (union) grocery chain and was paid about $12.00 per hour. No college degree. That $12.00 went far further than today’s $20.00 in purchasing power. But you guys are the gurus. What’s the solution? “Wow, Dave! How can you not be conspiratorial!” one of our longtimers asks incredulously after our remarks about New Orleans and Kansas City missing the Super Bowl this year. “Painting various groups as conspiratorial, with foil hats and being uneducated, are long-favored PSYOPS tactics. I didn’t expect that from you! – manipulation of gold, silver, Libor…Remember Bart Chilton? – numerous government agencies spying on you in concert with mega corps. “I find it hard to believe that the football games aren’t being manipulated to favor the larger markets for all the obvious reasons the reader stated. “If you’re mad as hell, then don’t watch!!! The 5: It’s a matter of choosing one’s battles… and knowing how readily evidence can be uncovered. Various market manipulations? NSA spying? Reporters clearing their stories with CIA sources before publication? The evidence is already public. Keeping a Drew Brees feel-good story out of the Super Bowl because the NFL is heavily invested in its return to Los Angeles? That seems like small potatoes… and proving it would be a mighty uphill climb. P.S. Would you believe there’s a cannabis retailer already raking in more cash per square foot than the boutique stores with high-end smartphones? Or the stores with diamonds in blue boxes? Wall Street’s best and brightest are still overlooking it… but not for long, says our Ray Blanco. It’s still trading for less than $4 a share… but again, not for long. Not based on Ray’s research. Check it out right here. And make sure you do so right away. Ray explains why it’s such a time-sensitive opportunity.